A month has passed since the devastating floods occurred in Uttarakhand in India. The disaster which tore down villages, numerous roads and other vital infrastructure has claimed over 800 lives and several thousand are still missing. The Nishkam Centre is working with Divine Onkar Mission (DOM) raising cash, clothing and awareness for the international flood disaster appeal. 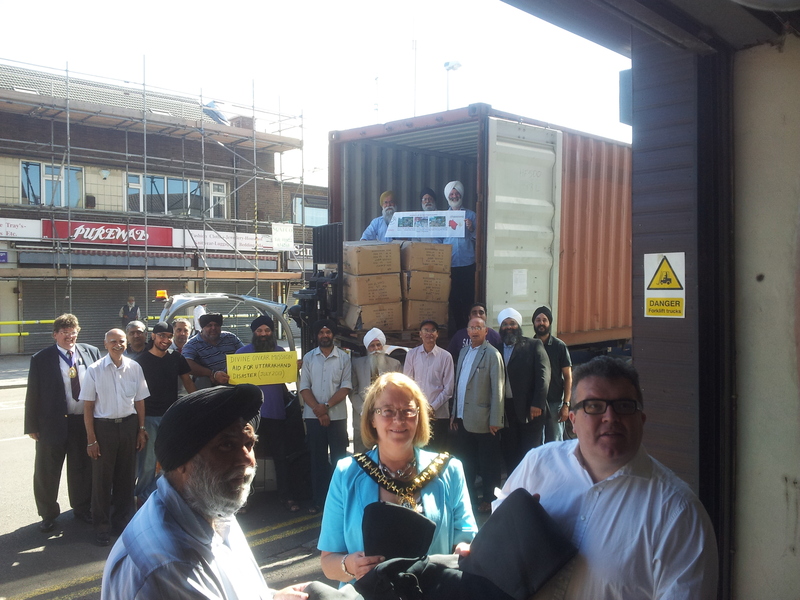 The Mayor of Sandwell, Councillor Linda Horton and Tom Watson MP for West Bromwich East were amongst some of the dignitaries invited to a reception by DOM and sponsors, Mann Brothers, to see donated clothing be loaded on to a container destined for India. The disaster has claimed many lives and left more still missing. Divine Onkar Mission along with other faith based and relief organisations has pledged to support the victims. The Nishkam Centre partnered with DOM to provide humanitarian aid and support to fellow human beings in their hour of need so that they start to rebuild their lives. Friday 19th July saw the first visible manifestation of the campaign with the donated clothes being transferred in to a 40ft container to make its way to the flood stricken area of India. The container and shipping arrangements have been undertaken by one of DOM’s patrons, Mr Paramjit Singh Mann operating Mann Brothers Ltd in West Bromwich. As the magnitude of the tragedy continues to unfold many people are donating clothes and money to help in whatever way they can. Tersam Lal, the Founder and Chairman of DOM said, “It is very important that people realise the calamity of what has happened. The disaster may have been last month but the effect will be felt for many generations. We see children orphaned, whole communities washed away and so many still missing; our aim of helping the needy in some of the most remote parts of India has never been more challenging. DOM’s local aid teams in India have distributed clothing, food, medicine and solar powered cookers to villages that were affected by the disaster. These cookers were much needed as people affected by the disaster have food but no means or facility for heating or cooking it”. He continued, “Today is important, the Mayor of Sandwell, Councillor Linda Horton and Tom Watson MP being here shows the support we have from the locality and the Nishkam Centre is a great partner for us. 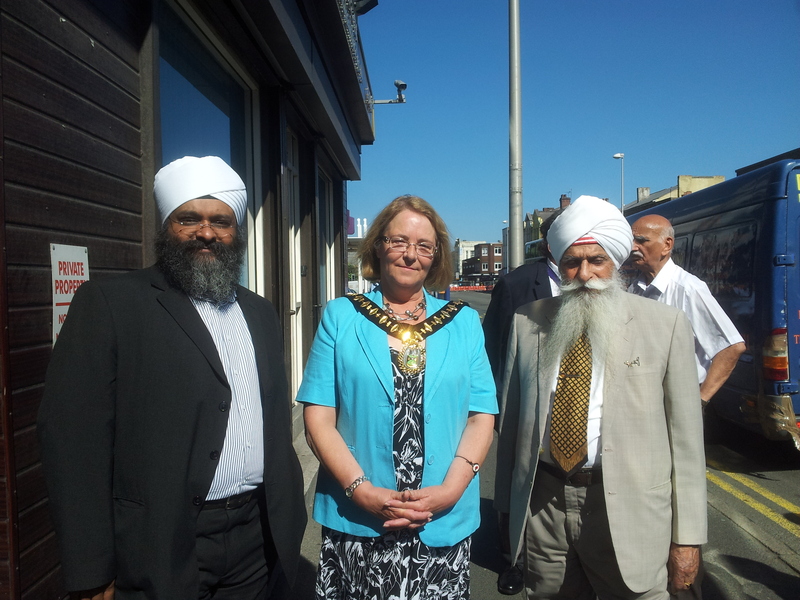 I must also acknowledge the fantastic support from others in particular our patron, Bhai Sahib Mohinder Singh and Parmjit Singh Mann for their assistance. Mann Brothers are the sponsors, coordinators and donors of the whole operation today – we thank them for their ongoing support”. Sewa Singh Mandla, Trustee of Nishkam Centre said, “Whilst it disheartens me to be standing here watching yet another humanitarian aid container leaving West Bromwich, it warms me to see that so many people have come together to donate generously whatever they can to support the campaign. I know we have had clothes, money, the container and many volunteer hours gifted to this cause not to mention the vast amount of prayer services that have taken place globally for the welfare of all humanity”. Director of the Nishkam Centre, Amrick Singh Ubhi, said, “We need to continue the campaign relentlessly. DOM has made a commitment to build a new school for the children in the affected areas. The appeal continues to move forward with a request for further support from those who can give. The clothes and cash donations will always only be a drop in the ocean. We are working with DOM because Mr Lall and his team are on the ground in India, they will be there for the long-term – long after the world’s attention has shifted to the next breaking news. We will continue to support DOM to ensure the people of this disaster receive our assistance to rebuild their lives”. Guru Nanak Nishkam Sewak Jatha Gurudwara, Soho Road, Handsworth. 1. Divine Onkar Mission is a UK registered charity. Founded by Tersam Lal in 1991 with the aim of helping the needy in some of the most remote parts of India. Their projects are based in Jharkhand and Orissa, two of the poorest states in India. Many live in miserable conditions without basic necessities such as clean water, medical care, employment and daily food and the charity addresses these areas. They extend their hands, hearts and funds to enable them to break out of the cycle of poverty through the provision of basic human rights, by providing education and training opportunities to enable people to eventually be self-sufficient. 2. Guru Nanak Nishkam Sewak Jatha (GNNSJ) is a multi-faceted, faith based organisation practicing and propagating the Sikh Dharam (faith) in the name of Guru Nanak Dev Ji (1469-1539). It has been involved in selfless intra-faith work in Kenya and India informally since 1950, and formally in the UK since 1978 as a registered Charity through five centres for excellence in the inner-city area of Handsworth, Birmingham, where its Headquarters are based. GNNSJ also has sister organisations in Leeds and London (UK) and branches in Kericho (Kenya) and Amritsar (India). Significant achievements have been made by GNNSJ in the conservation and restoration of historical Sikh shrines. Chaired by Bhai Sahib Dr Mohinder Singh it aims to serve and uplift society through the practice of core values – nishkamta, or the spirit of selflessness, being one of them. Inspired by Dharam (religion) GNNSJ has generated a flourishing culture of volunteering, which has contributed immensely to transforming visionary projects into reality. For his services to religious faith propagation, community service, education and research, Bhai Sahib has been awarded two Honorary Doctorates from Birmingham’s Universities. Bhai Sahib Mohinder Singh was also created a knight by the Holy Father Pope Benedict XVI in recognition of his dedicated work for Roman Catholic-Sikh relations and for his enthusiastic commitment to working for peace among people of all faiths. He is passionate about values-based education and is the Patron of the Nishkam Education Trust which has set-up Nishkam Nursery (2009), Nishkam Primary Free School (2011) and Nishkam Secondary School with 6th Form (2012).